Components wise its really fantastic. All the animals and vegetables are nice meeples and there are really a LOT of bits. Indeed, the box is HUGE. Think Terra Mystica box but thicker. Yes THICKER. Its amazing my friend's luggage did not go overweight from his Essen trip. Also, since it plays 1 to 7, there are quite a lot of boards for the different number of players. For our first game. we had 4 players. 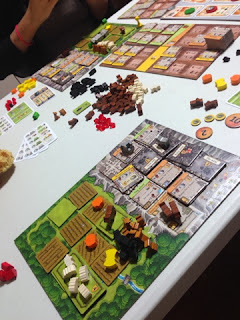 Most of us have played Agricola before (once or twice) so I was anticipating we should be able to jump into the game easily. The rules were nicely laid out so that certainly helped us absorb the newer rules and jump right in without much problems. Game time length was about 3 hours which is slightly longer than I would have liked but when you are playing the game you won't really feel it unless someone takes too long placing their token to activate the action. Caverna is a worker placement game that lasts 12 rounds and at the end, players count the number of animals and vegetables they have, add them to the points they have in the rooms they built as well as any end game scoring items and whomever has the most points will win the game. I suspect average score will be about 80+ unless someone runsaway with it and this was what happened in our game. I started off aiming for the expedition path because I wanted to try something different but the draw of the new was too much and 3 of us ended up aiming for the same thing. This left Grace who happily got those spots for farming and build up quite a good farm before she switched to building and got all those rooms that gave her a lot of end game scoring. In the end, she was around 120+ and I was second with 80+ so she "slapped us around" silly LOL. Tip for players out there and indeed this was covered in the rules, you MUST guard each other so as not to have such a scenario happening. This brings me to a few concerns I have with the game. Guarding each other is essential and is not uncommon in many games. However in most games, when you do guard someone, its does not then govern what you yourself can do. Usually you can guard someone and still somewhat keep the direction you were heading at the start. This however can cause you to change your entire plans especially if you are the only one attempting to guard aganist a runaway player. Also once you realise that player is running away with it, its almost impossible to stop as you are too heavily invested in your direction to make a change. Replayability also maybe a concern. All the buildings are available for every game and the only randomness, besides players' choices, will be the action cards that appear every round. However, the action spaces are divided into 3 stages and there are 3 cards stipulated for each stage. So randomness will come from the sequence in which these 3 cards will appear for each stage. To a smaller extent, for the last 6 or 7 rounds, the harvest is randomly determined by hidden chits and this does add to replayability but only has a very small effect. Not sure if there is an optimum strategy after a few plays due to the amount of open information available. So overall, the game feels very similar to Agricola with a new scoring path. It is ok but I don't feel too wow-ed about it after my first play. This may change in future plays though because I was too concerned tactically to plan strategically by seeing what end game scoring buildings I can build. I do have some concerns about the game but I won't mind playing it again. While I shudder at how long a 7 player game will take, I will like to try it at least once :) I will probably not need to have a copy in my collection though.